Pets love artificial grass just as much as you are going to! grass is right for your home. 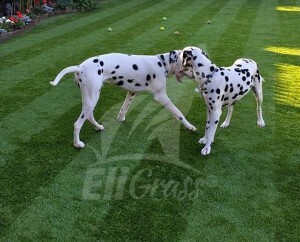 At EliGrass, we take the health of your pets seriously and provide high quality artificial grass that is 100% safe and effective for all your furry family members. We understand how important it is to provide your pets with a space they can enjoy outdoors. The best grass for dogs doesn’t have to be natural, however. Some pet owners fear that their pet won’t like synthetic grass and will refuse to use the bathroom outside. However, we provide products that make your pet feel comfortable being outdoors. 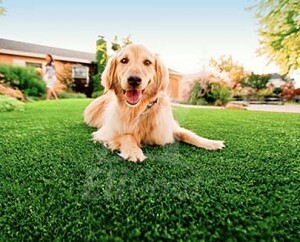 Our artificial grass for pets ensures a healthy outdoor environment for everyone. Artificial grass is also extremely low-maintenance, meaning you never have to fertilise or apply pesticides to your lawn. This allows your pets to enjoy the outdoors year round. You also never have to worry about harmful toxins affecting your pets when you choose EliGrass artificial grass. Regardless of the season, your pets can thoroughly enjoy their time outdoors when your lawn is manufactured from the best grass for pets available. Unlike natural grass, synthetic grass is stain resistant making it easy to clean up after your pets. Instead of staining the grass, your pet’s elimination will seep through draining out in a safe and effective manner keeping your lawn beautiful and healthy all year long. If you want a beautiful lawn for decades to come, then consider artificial grass for your landscaping. If you’re looking for the best grass for dogs look no further than EliGrass turf ranges.